Whether you have a garden or you want to make sure you have good security around your Grapevine home, outdoor lighting options are plentiful. There is outdoor low voltage LED lighting choices that aren’t costly and that don’t use a lot of electricity. Landscape lighting showcases what your garden and outdoor space have to offer, but you don’t want the lights to be too bright. Even commercial properties are toning down their lighting and choosing low voltage options that are not overly bright, but still light up the area very well. Landscape lighting that uses LEDs can complement your outdoor space. They’re low voltage so you won’t feel like there are floodlights shining in your yard. LED lights are cool to the touch, ensuring your outdoor spaces stay comfortable and landscaping plants and flowers are safe. LED lights are safe to place close to plants, flowers, and decorations, without any risk of damaging them from the heat of the bulbs. 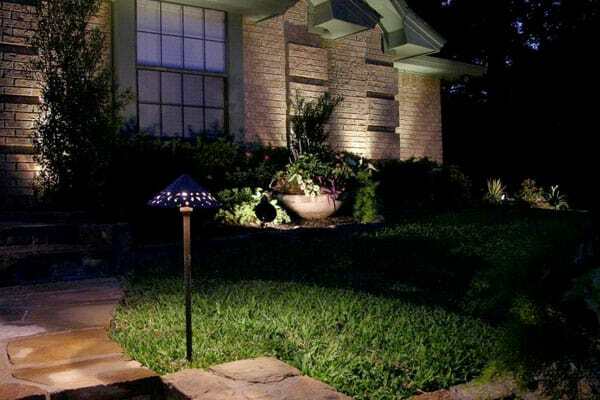 The safety and quality of good low voltage LED landscape lighting makes it a great choice for any sized yard. By planning out where the landscape and security lights should be before you have them installed, you can get the look you want the first time, and love your yard day or night. Being close to the DFW International Airport is a big plus to the majority of people who live in the Grapevine area. The downtown corridor is historic, and wineries in the area make it a popular place for singles and couples who want to enjoy the beauty of nature and have a relaxing glass of wine. The city is also adjacent to Grapevine Lake, which is both a recreational area and a water source for the city. Grapevine has been chosen by CNNMoney as one of the best places to live and is growing because so many people love the area and want to live there. The proximity to the airport makes it convenient for business and recreational travelers, and also offers plenty of work opportunities for the people who live close by. The area where Grapevine is now was first settled in the 1840s and 1850s, and from those humble beginnings, the entire city developed into a current population of nearly 50,000. If you live in Grapevine, the quality of life is high. The schools are good, the historic downtown area always has something going on, and there are shops and restaurants to explore. There is also the rugged beauty of the natural surroundings, which you can enjoy in parks and even in your own backyard. Immediate service and well done! 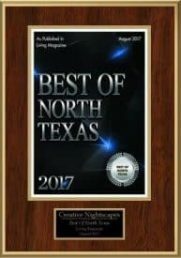 Great experience working with creative night scapes! The very day I called them, the owner himself came out and walked around our property as we talked through where to put the lights. He was very knowledgeable and very helpful! His crew was there within the week to install all the lights. It’s been several months now, and we’ve had no problems. I love that the lights are on a timer so we never have to worry about turning them on and off. Also if you need to extend the time longer because you’re having a party, it’s so easy to change. Highly recommend creative night scapes! My house sits at the end of a dark cul de sac. For years I have used Malibu lights to light my house with mixed results. I finally made the jump to a professional company at creative lights and so glad I did. My house finally looks the way I always dreamed it would. I highly, highly recommend this company. Don't put it off another day. The planning and installation of my lighting project was excellent . We love it and "it works". Creative Nightscapes did a fabulous job with my house and tree lighting! They were so responsive and quick to come out!! They came out the same day I called and I had a design and quote within a few days. The lighting is perfect and the installation was quick as well. Installed kichler lighting system on home in Grapevine. Up lighting on front facade with accent hardscape light over garage. Tree down lighting around pool area. Installed Kichler LED outdoor lighting at home in Autumn Creek. Placed up lights to accent various trees in the front and back yards. Removed existing fixtures from front of home and installed Kichler LED low voltage landscape lighting at home in Walker Farms. Placed up lights to accent facade of home, front entry, and address. Installed Kichler LED outdoor lighting at home in Winding Creek Estates. Placed up lights to accent facade of home, Crepe Myrtle, large Oak tree, and other tree canopies. Set path lights to highlight front walkway. Mounted down lights to create moonlight effect and illuminate patio, walkway, and landscape beds. Placed wash lights to accent stones and landscape. Installed Kichler LED lighting at home in Lakeside Estates. Placed up lights to accent peaks of home and trees in front and back yard. Mounted down lights to highlight patio, steps, and corner of home. Installed Kichler LED lighting at home in Lake Pointe. Mounted down lights in eaves and trees to create moonlight effect and illuminate jungle gym, pool deck, seating area, swing, yard, and game area for kids. Upgraded existing fixtures to LED and installed new Kichler LED lighting at home in Stone Gate. Placed spot lights to accent tree canopies. Set path lights to highlight walkway right of the patio. Placed wash lights to accent landscape in back yard. Installed Kichler LED outdoor lighting at home in Glade Landing. Placed up lights to accent columns. Mounted down lights in eaves and trees to create moonlight effect and illuminate yard, walkway, and landscape greenery. Removed existing lighting and installed Kichler LED landscape lighting at home in Western Oaks. Mounted down lights in trees to create moonlighting and highlight walkways, steps, driveway, and pool deck. Placed up lights in front yard to accent facade of home, peaks, and front entry. Installed Kichler LED outdoor lighting at home in Grapevine Lake Estates. Mounted down lights under eaves and in trees to create moonlight effect, illuminate walkway, driveway area, landscape greenery, boulders, driveway entrance, and yard. Placed up lights in landscape beds and gutter to accent facade of home and dormer. Installed Kichler LED outdoor lighting at home in Druid Hills: up lights accenting facade on either side of entry, up lights highlighting Crepe Myrtles and Oak trees, path lights illuminating steps at entry and walkway in back yard, up lights in back accenting ornamental trees and canopies of Pecan and Oak trees, down lights mounted to moonlight walkway to patio and patio seating area. Installed Kichler LED outdoor lighting at home in Trail Lake. Mounted down lights in oak tree moonlighting the circular driveway. Placed up lights to accent the facade of home, tree canopies, and columns. Installed Kichler LED outdoor lighting at home in Lakeside Estates. Mounted down lights in trees to create moonlighting across walkways, bridge, garden, and yard area. Placed 2 in 1 in pond to illuminate waterfall, pond, and tree. Set an up light under Crepe Myrtle accent tree canopy. Installed Kichler LED lighting at home in Grapevine on 12/7/2016. Performed semi-annual maintenance for residential client in Grapevine; rewired backyard lights, added two Kichler LED Dome Path Lights, replaced digital timer, and cleaned all Kichler LED lights.